2O, explaining and rationalizing the various electronic and physical properties and features manifested by its peculiar bonding arrangements. 2O reveals four different energy levels that correspond to the ionization energies of the two bonding and two nonbonding pairs of elections at 12.6eV, 14.7eV, 18.5eV, and 32.2eV. This suggest that neither the two O-H bonds nor the two sp3 lone pairs are degenerate in energy. 2O, the 2s orbital of oxygen is mixed with the premixed hydrogen orbitals, forming a new bonding (2a1) and antibonding orbital (4a1). Similarly, the 2p orbital (b1) and the other premixed hydrogen 1s orbitals (b1) are mixed to make bonding orbital 1b1 and antibonding orbital 2b1. The two remaining 2p orbitals are unmixed. While this simple MO diagram does not provide four different energy levels as experimentally determined from PES, the two bonding orbitals are nonetheless distinctly different thus providing differentiation on the bonding electron energy levels. 2O MO diagram can also be derived by performing the Walsh diagram treatment via adjusting bonding geometry from linear to bent shape. 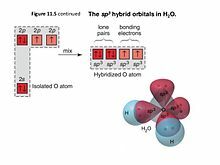 In addition, these MO diagrams can be generated from bottom up by first hybridizing the oxygen 2s and 2p orbitals (assume sp2 hybridization) and then mixing orbitals of same symmetry. For simple molecules, pictorially generating their MO diagram can be achieved without extensive knowledge of point group theory and using reducible and irreducible representations. 2O can be explained via the concept of isovalent hybridization or Bent's rule. In short, s character is accumulated in lone pair orbitals because s character is energy lowering relative to p character, and lone pair electrons are closely held with unshared electron density. In contrast, bonding pairs are localized further away and electron density is shared with another atom, so additional s character does not lower energy quite as effectively. Hence, comparatively more p character is distributed into the bonding orbitals. Isovalent hybridization refers to advanced or second order atomic orbital mixing that does not produce simple sp, sp2, and sp3 hybridization schemes. For molecules with lone pairs, the bonding orbitals are isovalent hybrids since different fractions of s and p orbitals are mixed to achieve optimal bonding. Isovalent hybridization is used to explain bond angles of those molecules that's inconsistent with the generalized simple sp, sp2 and sp3 hybridization. For molecules containing lone pairs, the true hybridization of these molecules depends on the amount of s and p characters of the central atom which is related to its electronegativity. "According to Bent's rule, as the substituent electronegativies increase, orbitals of greater p character will be directed towards those groups. By the above discussion, this will decrease the bond angle. In predicting the bond angle of water, Bent’s rule suggests that hybrid orbitals with more s character should be directed towards the very electropositive lone pairs, while that leaves orbitals with more p character directed towards the hydrogens. This increased p character in those orbitals decreases the bond angle between them to less than the tetrahedral 109.5°." Molecular Orbital Theory vs. Valence Bond Theory has been a topic of debate since the early to mid 1900's. Despite continued heated debate on which model more accurately depict the true bonding scheme of molecules, scientists now view MO and VB theories as complimentary and teammates. With the development of modern high speed computers and advanced molecular modeling programs, both MO and VB theories are used widely today, though for generally different purposes. 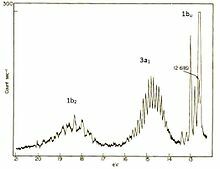 In general, MO theory can accurately predict the ground state energy of the system, the different electronic states energies of bonding and nonbonding orbitals, and magnetic and ionization properties in a straight forward manner. On the other hand, VB theory is traditionally useful for predicting bond angle and mechanism drawing. Modern valence bond theory can provide the same electronic information obtained by MO theory, though the process is more complicated. In addition, modern VB theory can also predict excited states energies in which MO theory cannot easily achieve. The truth is, both theories are equally important in understanding chemical bonding that while neither theory is completely comprehensive, the two together nonetheless provides a in-depth model for chemical bonds. In the words of Roald Hoffmann: "Taken together, MO and VB theories constitute not an arsenal, but a tool kit... Insistence on a journey... equipped with one set of tools and not the other puts one at a disadvantage. Discarding any one of the two theories undermines the intellectual heritage of chemistry." In short, valence bond theory and MO theory are at core, a manifestation of the Heisenberg Uncertainty Principle. When treating electrons in localized orbitals (VB theory), one can fairly accurately predict and measure its shape, geometry and position, but cannot accurate predict its energy and momentum. When treating electrons in delocalized orbitals (MO theory), one gains more measurements on its energy and momentum, but loses accuracy on its position. In other words, MO and VB theory should be used appropriately depending on what one wishes to measure. ^ Levine, I. N. (1991). Quantum Chemistry (4th ed.). Prentice-Hall. p. 475. ISBN 978-0-7923-1421-9. ^ "The MO Diagram of H2O" (PDF). ^ "Molecular Orbitals in Inorganic Chemistry: Hunt Research Group, Imperial College London". www.huntresearchgroup.org.uk. Retrieved 2017-04-21. ^ "Molecular Orbitals in Inorganic Chemistry" (PDF). ^ Laing, Michael (1987). "No rabbit ears on water. The structure of the water molecule: What should we tell the students?". Journal of Chemical Education. 64 (2): 124. Bibcode:1987JChEd..64..124L. doi:10.1021/ed064p124. ^ "Chem 216: Honors General Chemistry : The Lee Group Solid State Chemistry in the Lee Group". leelab.chem.cornell.edu. Retrieved 2017-04-21. ^ "Home". www.roaldhoffmann.com. Retrieved 2017-04-29. ^ Hoffmann, Roald; Shaik, Sason; Hiberty, Philippe C. (2003-10-01). "A Conversation on VB vs MO Theory: A Never-Ending Rivalry?". Accounts of Chemical Research. 36 (10): 750–756. doi:10.1021/ar030162a. ISSN 0001-4842. PMID 14567708. ^ "Contrasting MO and VB theory". Chemistry LibreTexts. 2013-10-02. Retrieved 2017-04-21.